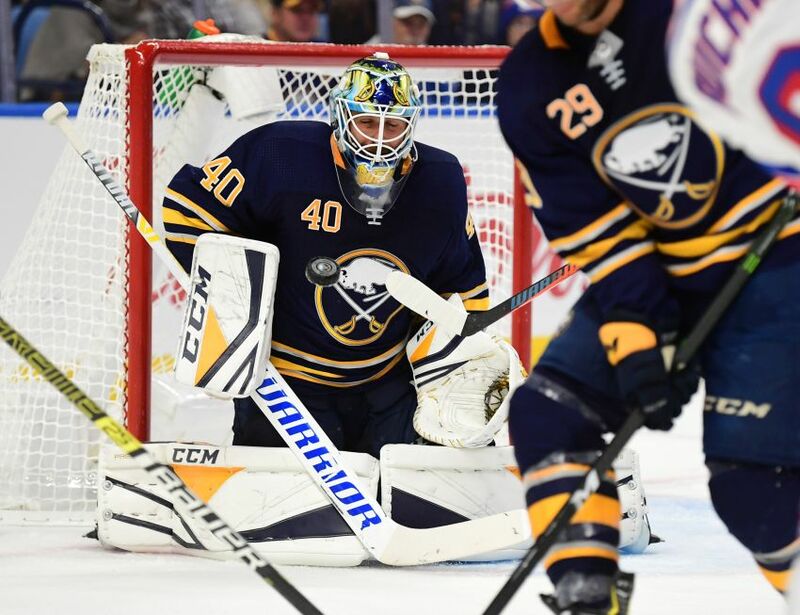 BUFFALO – In just a few weeks, goalie Carter Hutton has already instilled loads of confidence in the Sabres and established himself as one of the team’s strongest voices. How has Hutton, 32, done it so quickly? Well, for starters, Hutton often looked dynamic making 43 saves against the New York Rangers in Saturday’s 3-1 win. He even stymied a three-on-zero break, a stop that will probably be remembered in these parts for a long time. The loquacious Hutton also isn’t afraid to say what’s on his mind. He experienced a lot during his first nine years as a pro, consistently improving while playing in five organizations. While Housley wouldn’t confirm it, Hutton will almost certainly receive his third straight nod Monday afternoon against the Vegas Golden Knights at KeyBank Center. The Sabres want Hutton to become their backbone and help change the culture of a team with recent history of losing and a slew of new faces. That’s why they signed the UMass Lowell product to a three-year, $8.25 million contract on July 1. “It’s more important they trust me,” Hutton said. “You always have to earn it, you got to play well, you got to battle. I think early on, just showing how hard you work and the way you carry yourself goes a long way. Yes, it’s very early. But so far, Hutton’s impact in his first days as an NHL starter has been notable. Hutton keeps things calm by talking a lot on the ice. Hutton believes it’s easy to acclimate to a new team. Most hockey players, he said, share the same qualities. Of course, given the dues the undrafted Hutton paid to reach where he is today, his teammates might’ve had a healthy respect for him before he arrived. “He puts the work in, he’s a professional,” Sabres winger Kyle Okposo said. “He’s worked for everything he’s gotten in his career. I think that’s a testament to him, his mindset and the way that he prepares, the way that he believes in himself. Hutton earned his first NHL appearance in 2012-13, his third full pro season. He played a career-high 40 contests with the Nashville Predators a year later. Still, he did not crack the 30-game mark again until he played 32 times with the St. Louis Blues last season. That terrific campaign – he posted an NHL-best 2.09 goals-against average – landed Hutton his starting gig.